2Lt Charles E. Thomas (CP)(POW) - Missions flown with other Pilots (190, 234, 253, 254, 255) - Three Missions flown as 1st Pilot (249, 250, 251). Became POW on mission #255 11 Oct 44, to Wesseling, Germany, 1Lt Ernest C. Price (P), in B-17G 42-31739 Pugnacious Peter (358BS) VK-P. B-17 shot down and entire crew became POWs. 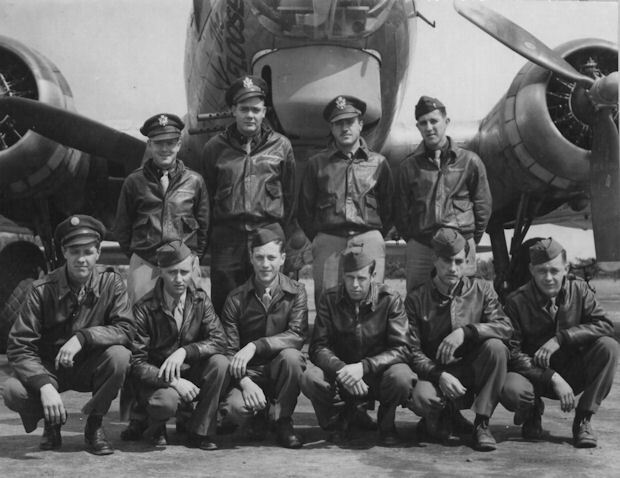 2Lt Thomas M. Atwood (N), S/Sgt Jack M. Johnson (E), S/Sgt Charles J. Rego (R), Sgt Henry R. Krebs (WG) and Sgt Lawrence J. Schneider (TG) - All missions flown with the Lt. McConnel Crew. 2Lt Robert W. Bennett (B) - Did not fly on mission #211. LtCol Lewis E. Lyle was the substitute Bombardier. S/Sgt Jerome R. Messerich (BTG) - Did not fly on missions 204, 213, 214 & 231 with the Lt McConnell Crew. Flew on missions 246, 247 & 248 with other Pilots. On mission #248 28 Sept 1944, to Magdeburg, Germany in B-17G #43-38176 (358BS) VK-B, 1Lt Walter J. Mayer (P) [MACR 10586) the B-17 was attacked by German fighters badly damaging the B-17 crew bailed out over friendly territory. Three crewmen were wounded and hospitalized. One crewmen was KIA and others were returned to Molesworth. Sgt James H. Tuchel (WG). Flew one mission with the 303rd BG(H) and Lt McConnel Crew (# 196). Removed from crew when 2nd Waist Gunner position was deleted from combat Crews.